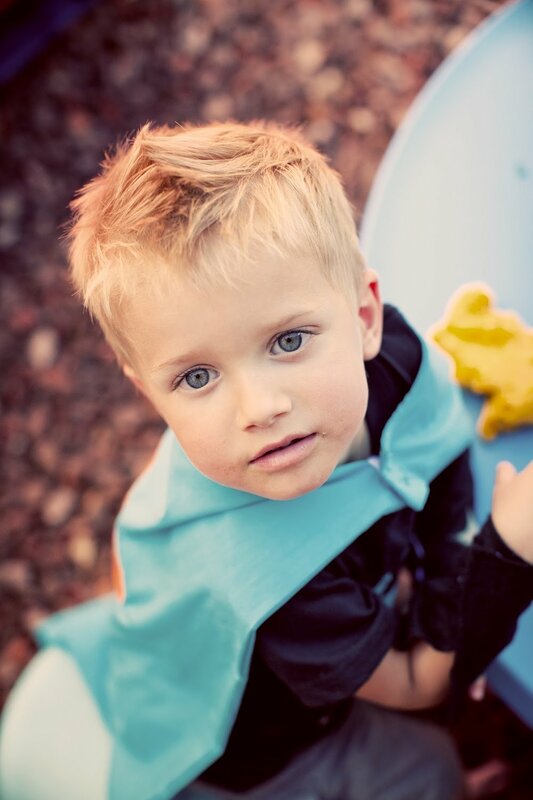 I started planning Hudson's Superhero party pretty early...I was pregnant and knew that I wouldn't have a lot of free time when we had a new baby in the house. I love being creative and enjoy being crafty when it isn't something that is rushed. So I had a lot of fun putting everything together for his party over the last several months. I started by making some capes for the kids to wear, however once I realized there would be about 25 kids at the party I decided to just make a few extras for them to wear in pictures. I used templates on MarthaStewart.com of lighting bolts and stars for the capes. Then i made masks for each kid to wear and take home with them. I made them out of the stiff black felt you can find at a craft store. I used a colored soft felt on one side of some of them to add a little color. You can also find the elastic at a craft store with sewing supplies to hold the mask on. Inside of the favor bags I gave the kids superhero fruit snacks, glow in the dark bouncy balls, superhero stickers, a superhero shaped glider, and star shaped silly bands. I ordered all of they toys for the favor bags from oriental trading. We had the party during lunch time, so we had Port of Subs cater it, with "Hero Sandwiches" and for the kids I made "Hero Sandwiches on a stick". I found this cute idea on Disney's Family Fun website here. 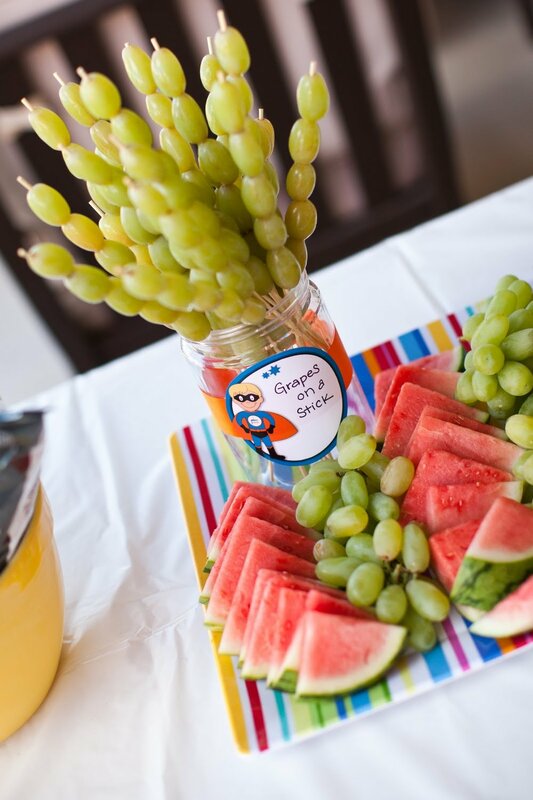 We also had a fruit tray and put some grapes on sticks for the kids. We served Mojitos for the adults and fruit punch aka "Powerful Punch" for the kids. We had a bounce house for the kids to play with, a play dough table, water tables, and the photo area for the kids to have their pictures taken. I love how the pictures came out with the backdrop! Melissa Young captured the day perfectly!